I was listening to Benedict Evans and Chris Dixon talking about micropayments, ad blockers, web and mobile publishing, and a few other interesting topics this morning and they were making the point that publishers have to go to platforms where their audiences are these days (Facebook, Apple, Medium, etc). I thought about that in the context of AVC and realized that we are most certainly a dinosaur. I publish using a wordpress instance running on a server in the cloud on my own domain. Direct traffic is the largest form of traffic AVC gets. 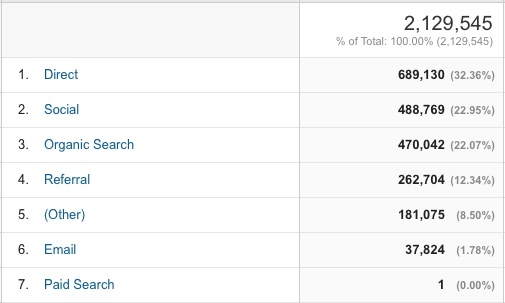 Organic search still drives as much traffic as social. 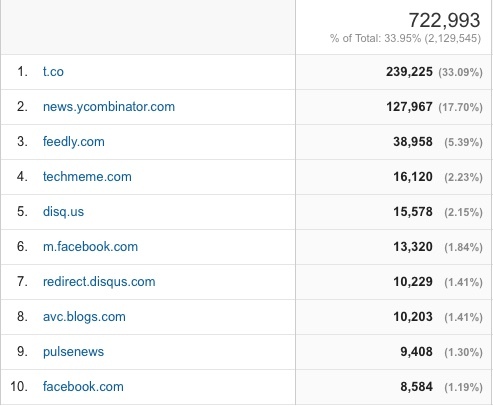 RSS still generates a meaningful amount of traffic (it is called (other) in the chart below). Within the social category, Twitter is king and Facebook is an also ran. All of this results in 250,000 web sessions a month, plus RSS and email which about double that. Over the course of a year, it’s over 5mm user sessions across web, email, and RSS. This pales in comparison to a real commercial publication. But it’s not too bad for a small community tended to by a single operator. We are most certainly old school in terms of the way this audience comes together. Maybe that’s why the audience has been flat for over five years now. But it still works very well for me and hopefully for all of you too.